This post is especially helpful for those who have a lot of MP4 connection and would like to convert MP4 to WebM on Mac for uploading your videos to HTML sites or creating a HTML5 page with ease. Before explaining why you need to create WebM video from MP4 video, you shall have a good understanding of HTML5. The fifth version of HTML standard is used for presenting content on world wide web, which has been used by 75.3% of all the websites on PC/Mac and phones as of now. With many newly added elements like <video>, <audio>, etc, HTML5 now makes your media files truly accessible without add-ons. It's proved that MP4 and WebM are two of the main formats for HTML5 video. Actually, both MP4 and WebM feature high compression ratio and are commonly used for online streaming, but more so with the latter. If you get a download of 1080p HD video from YouTube in MP4 or WebM, you will notice that the file size in WebM (33.32MB) is about 47% smaller than that in MP4 (49.03MB). Besides the high bandwidth usage and small size in WebM, the video format is open-source, royalty free, and is supported by many browsers, while MP4 is patented and non-free format. That's way the HTML video in MP4 can be only accessible if you have licenses from the individual patent holders. If you have a lot of MP4 videos and want to access or embed MP4 videos on HTML5 page, the best solution is to convert MP4 to WebM first using a MP4 video converter. Free download MacX Video Converter Pro to fast convert MP4, MOV, WMV, MTS, H.264, H.265, MPEG4, etc to WebM video with small size for embedding video in HTML5 site or simply download WebM to MP4 format at fast speed. 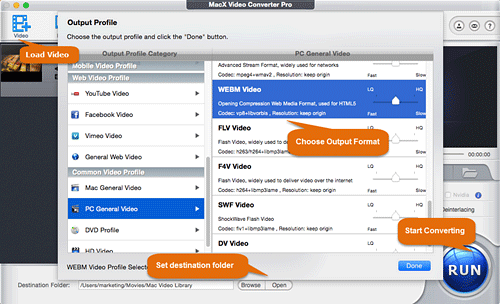 There are tons of HTML5 video converters out there for Mac, many of them being targeted for WebM conversion. But you will be informed of various problems with the conversion from MP4 to WebM. For example, Handbrake only converts WebM to MP4 and MKV on Mac and Windows but is not preset with WebM profile, let along the incomplete WebM encoding at times. FFmpeg comes with libvpx library error with message showing "Encoder (codec VP8) not found for output stream." While online video converter Zamzar puts you at the risk of virus infection during MP4 to WebM conversion. The good news is that MacXDVD Software's latest MacX Video Converter Pro is proved to support WebM HTLM5 video and fix all video convert errors at a short time. Supporting 370+ video/audio codecs from well-known MOV and MP4 to the latest H.265 and VP9, it helps to convert MP4 to WebM (VP8) in a few clicks, thus you can create HTML5 video easily. 1. It features a user-friendly interface to convert MP4 to WebM, as well as WebM to MP4 on Mac and PC immediately. 2. It encodes MP4 into WebM video at fast speed due to hyper-threading tech, Multi-core CPU (up to 8), hardware encoding technology, and deliver crisp image. 4.Fast download HTML5 video in WebM and watch it offline on iPhone, iPad and Android on the go. 5. It is 100% safe, without adware, spyware or virus. 6. it is compatible with macOS Sierra and Windows 10. To begin with, please free download the MP4 to WebM converter onto our Mac, or get the Windows version here. Then install and run it. Then, follow the procedures. Step 1: Load target MP4 video(s). Click the +video button to load MP4 video to be converted to WebM. Supporting batch convert, you can add more than one MP4 video at a time. After the video loading, go to PC General Video from the drop-down window -> Choose WebM Video -> click OK. Note: If you need to upload MP4 video to YouTube or Facebook, you can directly go to the Web Video Profile -> Choose YouTube Video or other online video profile directly. Tap Browse button to set the destination folder and click RUN to start MP4 to WebM conversion on Mac. What is MP4: MP4 is developed by Moving Picture Experts Group with a file extension the same as its format. It is a widely used container with H.264 codec, consisting video, audio, subtitles and images in a single file format. Due to its better compression efficiency and wide compatibility, it makes easier for transmission, uploading, storing, and playing on Apple, Sony, Android, Microsoft, and many other devices. What is WebM: WebM is developed by Google, which is especially designed for the web. It is open-source and is compressed with VP9 and VP8 codecs. Due to its small file size, free application, and high quality video, it is one of the standard supporting HTML5 and can be streamed over YouTube. Nowadays, Google Chrome, Firefox and VLC supports WebM while other mobile devices are incompatible with this format. Free download the best MP4 to WebM video converter - MacX Video Converter Pro to easily convert MP4 to WebM, MOV to WebM, MKV to WebM and more with original quality reserved and world's No.1 fast speed for freely sharing on HTML5 sites.